First off, I would like to thank the great people over at Crown for the early copy of Paradox Bound and the opportunity to review it. 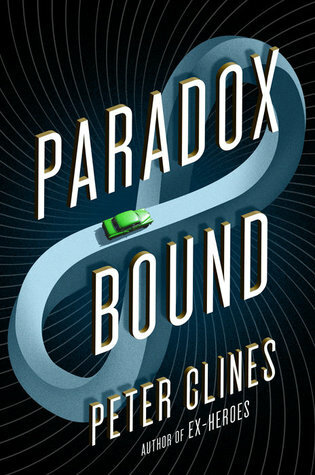 Paradox Bound is a fast-paced, thrilling, and imaginative read that shovels the American Dream onto your plate with a side of freedom fries. Eli Teague is just a normal kid; well, he was before he met Harry. Clad in Revolutionary War attire and driving a vehicle that predates the Great Depression, Harry definitely stands out from the crowd in the 20th Century. As their conversation begins, a loud rumble is heard in the distance and Harry becomes rushed to get the show back on the road. Eli looks to where the sound is coming from and sees a vehicle zooming towards them, a hand reaching out the driver’s side window and a gun in its grip. He looks to Harry, but the car is already around the corner. Both vehicles are gone and Eli is left to his bike and meager lunch. Similar appearances are made by Harry, both while Teague is older, and Eli has made it his purpose to find out more about this mysterious stranger; especially considering Harry hasn’t aged a bit since that fateful day. What happens next is a rickroll of an adventure across the United States, chock-full of history, myths, legends, and faceless men bound to stop them at whatever cost. I have been a fan of Clines since I picked up The Fold a couple of years ago. He has a way with storytelling that tends to always click in the right moment, tension always building up and then changing direction on a whim. The characters are likable and you always find yourself rooting for them until the very end, even if some of their decisions leave you scratching your head. The writing is simplistic and easy to pick up, and it is one that you can put down without forgetting everything you previously read. Clines also does a superb job of leaving little hints and clues along the way that all intertwine and come together to form a wonderful ending. All in all, PB was a really fun read and is a book for everyone, especially for those who like a little history with their thrilling action.